When John the baptizer grew up, he left the city and lived in the desert. He is described as wearing camel hair clothes and eating bugs. Many people though he was crazy, yet he attracted attention from large crowds of people. John preached a gospel message of repentance, preparing the way for the coming Messiah. For those who believed his message, John baptized them in the Jordan River. One day, while preaching and baptizing, Jesus came. 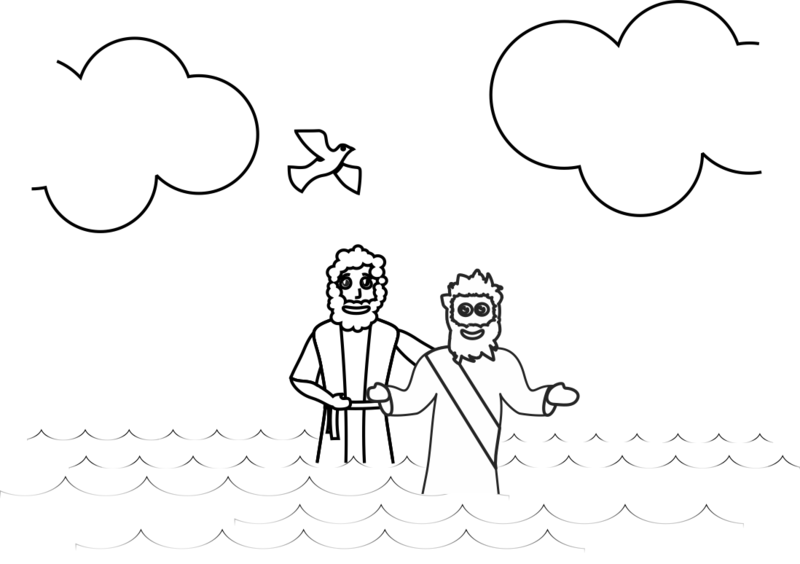 Jesus requested that he should be baptized by John. At first John refused, saying that he should be baptized by Jesus, not the other way around. Jesus told John it was ok to do this because it would fulfill prophecy. So, John baptized Jesus in the Jordan. When Jesus came up out of the water, the heavens opened and the Spirit of God descended on Jesus in the form of a dove, and a voice from heaven said, “You are my Son, whom I love; with you I am well pleased.” After his baptism, the Spirit took Jesus into the desert to be tempted by the devil. 1. Before class prepare your bowls by putting a small amount of dirt in each of the small bowls. Mix the dirt with a little bit of water to make mud. Fill the large bowl half way with water. Place the soap and towel beside the water bowl. 3. Explain that when we sin, it makes us dirty, as if we were covered in mud. One at a time, take the volunteer’s hands and cover them in mud). God is perfect, holy, and clean, and he can only have things that are holy and clean around him. When we sin and cover ourselves in this mud, we have separated ourselves from God. Psalm 57: 16-17 tells us that God does not delight in our sacrifices only, but rather an obedient heart. He wants us to repent of our disobedient ways and promise to follow him obediently. So that we would know what that looks like, Jesus himself was baptized. God was pleased with Jesus when he was baptized (Luke 3:22). God is also please with us when we demonstrate our obedience to him through baptism. ain't gonna study oh war no more. 1. Before class, write out the bible verse of small pieces of paper; one word per card. On the back of each card write a number corresponding to the place that word is in the verse. For example, on the back of the word ‘Look’, write the number 1, and so on. You can make two sets of cards if you want to make this a competitive game. 2. Place all the cards words down, numbers up on the floor. 3. One at a time, have a child toss a bean bag onto the papers on the floor. When the bag lands on a card, the child picks up the card and passes the bag to the next child. Repeat this process until all the papers have been picked up. 4. Have the children work together to put the cards in the right order. When the order is achieved, turn the papers over to reveal today’s bible verse. 1. Before class, prep the plastic cups by cutting a slit in the bottom of each one, big enough for a popsicle stick to easily fit in. 3. 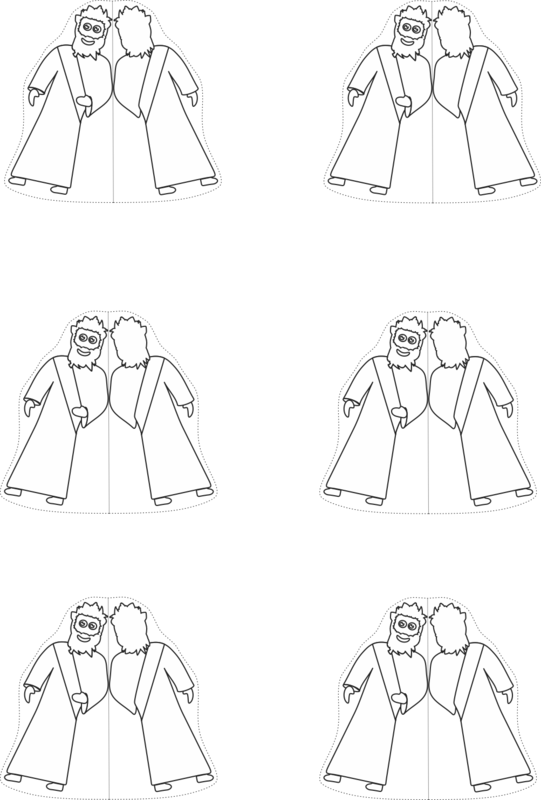 Give each child a Jesus doll template to color and cut out. 4. Fold the template on the dotted line and glue a stick in the middle. Make sure the stick is in the bottom half of the folded paper. 5. Put the stick inside the cup and through the slit. Move Jesus in and out of the cup by controlling the stick that comes out of the bottom of the cup.